Noah Webster (October 16, 1758 – April 28, 1843) was an American lexicographer, textbook author, spelling reformer, political writer, and editor. He has been called the "Father of American Scholarship and Education." His Blue-backed Speller books taught five generations of children in the United States how to spell and read, and in the U.S. his name became synonymous with dictionary, especially the modern Merriam-Webster dictionary that was first published in 1828 as An American Dictionary of the English Language. Noah Webster was born on October 16, 1758, in the West Division of Hartford, Connecticut to an established American family. His father Noah Sr. was a farmer and a weaver. His father was a descendant of Connecticut governor John Webster; his mother, Mercy Steele, was a descendant of Governor William Bradford of Plymouth Colony. Noah had two brothers (Abraham and Charles) and two sisters (Mercy and Jerusha). His childhood home, the Noah Webster House, is now a National Historic Landmark and a museum. At the age of 16, he began attending Yale University. His four years at Yale overlapped with the American Revolutionary War, and because of food shortages, many of his college classes were held in Glastonbury, Connecticut. During the American Revolution, he served in the Connecticut Militia. He graduated from Yale in 1778. He taught school in Glastonbury, Hartford, and West Hartford. He earned his law degree in 1781 but didn't practice until 1789, when he found that law wasn't to his liking. Instead he tried teaching, setting up several very small schools that did not thrive. Webster married Rebecca Greenleaf on October 26, 1789. They had eight children: Emily Schotten, Frances Julianna, Harriet, Mary, William Greenleaf, Eliza, Henry, and Louisa. By 1781, Webster had an expansive view of the new nation. American nationalism was superior to Europe because American values were superior, he explained. America sees the absurdities—she sees the kingdoms of Europe, disturbed by wrangling sectaries, or their commerce, population and improvements of every kind cramped and retarded, because the human mind like the body is fettered 'and bound fast by the chords of policy and superstition': She laughs at their folly and shuns their errors: She founds her empire upon the idea of universal toleration: She admits all religions into her bosom—She secures the sacred rights of every individual; and (astonishing absurdity to Europeans!) she sees a thousand discordant opinions live in the strictest harmony ... it will finally raise her to a pitch of greatness and lustre, before which the glory of ancient Greece and Rome shall dwindle to a point, and the splendor of modern Empires fade into obscurity. Webster dedicated his Speller and Dictionary to providing an intellectual foundation for American nationalism. 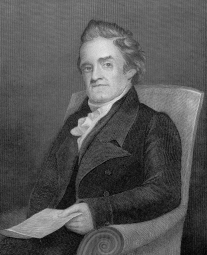 In the 1780s, Noah Webster was an outspoken Federalist. In terms of political theory, he deemphasized virtue (a core value of republicanism) and emphasized widespread ownership of property (a key element of liberalism). Webster married well and had joined the elite in Hartford but did not have much money. In 1793, Alexander Hamilton loaned him $1,500 to move to New York City and edit a Federalist newspaper. In December, he founded New York's first daily newspaper, American Minerva (later known as The Commercial Advertiser). He edited it for four years, writing the equivalent of 20 volumes of articles and editorials. He also published the semi-weekly publication, The Herald, A Gazette for the country (later known as The New York Spectator). As a partisan, he soon was denounced by the Democratic-Republicans as "a pusillanimous, half-begotten, self-dubbed patriot," "an incurable lunatic," and "a deceitful newsmonger ... Pedagogue and Quack." Fellow Federalist Cobbett labeled him "a traitor to the cause of Federalism," calling him "a toad in the service of sans-cullottism," "a prostitute wretch," "a great fool, and a barefaced liar," "a spiteful viper," and "a maniacal pedant." The master of words was distressed. Even the use of words like "the people," "democracy," and "equality" in public debate bothered him, for such words were "metaphysical abstractions that either have no meaning, or at least none that mere mortals can comprehend." Webster always admired French radical thought, and unlike most Federalists he did not recoil at the execution of Louis XVI of France. He urged a neutral foreign policy. But when French ambassador Edmund Genêt set up a network of pro-Jacobin "Democratic Republican societies" that entered American politics and attacked Washington, Webster condemned them. He called on fellow Federalist editors to "all agree to let the clubs alone—publish nothing for or against them. They are a plant of exotic and forced birth: the sunshine of peace will destroy them." For decades he was the most prolific author in the new nation, publishing textbooks, political essays for his Federalist Party, and newspaper articles at a remarkable rate (a modern bibliography of his published works required 655 pages). The Websters moved back to New Haven in 1798, and he served in the Connecticut House of Representatives in 1800 and 1802-1807. As a teacher, he had come to dislike American elementary schools. They could be overcrowded, with up to seventy children of all ages crammed into one-room schoolhouses, poorly staffed with untrained teachers, and poorly equipped with no desks and unsatisfactory textbooks that came from England. Webster thought that Americans should learn from American books, so he began writing a three volume compendium, A Grammatical Institute of the English Language. The work consisted of a speller (published in 1783), a grammar (published in 1784), and a reader (published in 1785). His goal was to provide a uniquely American approach to training children. His most important improvement, he claimed, was to rescue of "our native tongue" from "the clamor of pedantry" that surrounded English grammar and pronunciation. He complained that the English language had been corrupted by the British aristocracy, which set its own standard for proper spelling and pronunciation. Webster rejected the notion that the study of Greek and Latin must precede the study of English grammar. The appropriate standard for the American language, argued Webster, was "the same republican principles as American civil and ecclesiastical constitutions," which meant that the people-at-large must control the language; popular sovereignty in government must be accompanied by popular usage in language. "The truth is general custom is the rule of speaking—and every deviation from this must be wrong." The Speller was arranged so that it could be easily taught to students, and it progressed by age. From his own experiences as a teacher, Webster thought the Speller should be simple and gave an orderly presentation of words and the rules of spelling and pronunciation. He believed students learned most readily when he broke a complex problem into its component parts and had each pupil master one part before moving to the next. Ellis argues that Webster anticipated some of the insights currently associated with Jean Piaget's theory of cognitive development. Webster said that children pass through distinctive learning phases in which they master increasingly complex or abstract tasks. Therefore, teachers must not try to teach a three-year-old how to read; they could not do it until age five. He organized his speller accordingly, beginning with the alphabet and moving systematically through the different sounds of vowels and consonants, then syllables, then simple words, then more complex words, then sentences. The speller was originally entitled The First Part of the Grammatical Institute of the English Language. Over the course of 385 editions in his lifetime, the title was changed in 1786 to The American Spelling Book, and again in 1829 to The Elementary Spelling Book. Most people called it the "Blue-Backed Speller" because of its blue cover, and for the next one hundred years, Webster's book taught children how to read, spell, and pronounce words. It was the most popular American book of its time; by 1861, it was selling a million copies per year, and its royalty of less than one cent per copy was enough to sustain Webster in his other endeavors. Some consider it to be the first dictionary created in the United States, and it helped create the popular contests known as spelling bees. Part three of his Grammatical Institute (1785) was a reader designed to uplift the mind and "diffuse the principles of virtue and patriotism." "In the choice of pieces," he explained, "I have not been inattentive to the political interests of America. Several of those masterly addresses of Congress, written at the commencement of the late Revolution, contain such noble, just, and independent sentiments of liberty and patriotism, that I cannot help wishing to transfuse them into the breasts of the rising generation." Students received the usual quota of Plutarch, Shakespeare, Swift, and Addison, as well as such Americans as Joel Barlow's Vision of Columbus, Timothy Dwight's Conquest of Canaan, and John Trumbull's poem M'Fingal. He included excerpts from Thomas Paine's The Crisis and an essay by Thomas Day calling for the abolition of slavery in accord with the Declaration of Independence. Slowly he changed the spelling of words, such that they became “Americanized.” He chose s over c in words like defense; he changed the re to er in words like center; he dropped one of the l's in traveller; at first he kept the u in words like colour or favour, but he dropped it in later editions. Unauthorized printing of his books, and disparate copyright laws that varied among the thirteen states, led Webster to champion the federal copyright law that was successfully passed in 1790. In 1806, Webster published his first dictionary, A Compendious Dictionary of the English Language. The following year, at the age of 43, Webster began writing an expanded and comprehensive dictionary, An American Dictionary of the English Language, which would take 27 years to complete. To supplement the documentation of the etymology of the words, Webster learned 26 languages, including Anglo-Saxon and Sanskrit. Webster hoped to standardize American speech, since Americans in different parts of the country spelled, pronounced, and used words differently. During the course of his work on the book, the family moved to Amherst, Massachusetts in 1812, where Webster helped to found Amherst College. In 1822, the family moved back to New Haven, and Webster was awarded an honorary degree from Yale the following year. Webster completed his dictionary during his year abroad in 1825 in Paris, France and at the University of Cambridge. His book contained 70,000 words, of which 12,000 had never appeared in any earlier published dictionary. As a spelling reformer, Webster believed that English spelling rules were unnecessarily complex, so his dictionary introduced American English spellings like "color" instead of "colour," "wagon" instead of "waggon," "center" instead of "centre," and "honor" instead of "honour." He also added American words that were not in British dictionaries like "skunk" and "squash." At the age of 70, Webster published his dictionary in 1828. Though it now has an honored place in the history of American English, Webster's first dictionary only sold 2,500 copies. He was forced to mortgage his home to bring out a second edition, and his life from then on was plagued with debt. In 1840, the second edition was published in two volumes. On May 28, 1843, a few days after he had completed revising an appendix to the second edition, and with much of his efforts with the dictionary still unrecognized, Webster died. Webster was a devout Congregationalist. However, his Speller was entirely secular. It ended with two pages of important dates in American history, beginning with Columbus's in 1492 and ending with the battle of Yorktown in 1781. There was no mention of God, the Bible, or sacred events. "Let sacred things be appropriated for sacred purposes," wrote Webster. As Ellis explains, "Webster began to construct a secular catechism to the nation-state. Here was the first appearance of 'civics' in American schoolbooks. In this sense, Webster's speller was the secular successor to The New England Primer with its explicitly biblical injunctions." In my view, the Christian religion is the most important and one of the first things in which all children, under a free government ought to be instructed...No truth is more evident to my mind than that the Christian religion must be the basis of any government intended to secure the rights and privileges of a free people. Webster released his own edition of the Bible in 1833, called the Common Version. He used the King James Version as a base, and consulted the Hebrew and Greek along with various other versions and commentaries. Webster molded the KJV to correct grammar, replaced words that were no longer used, and did away with words and phrases that could be seen as offensive. All editions of Webster's Dictionary published in 1913 and earlier, along with the Webster Bible, and Dissertation on the English Language are available in the public domain. This page was last modified on 6 December 2018, at 17:24.